>>> back now at 7:50. with a horrifying and deadly polar bear attack in norway, the victims, a group of teenagers, on a wildlife adventure camping trip . martin fletcher is in london with details on this. good morning. >> matt, good morning two british survivors of that horrific attack by the polar bear returned home this weekend, two in the hospital in norway, attacked at dawn by a bear looking for food. they're adorable at a distance and when well fed. when the polar bears are mean killing machines. ten feet tall, they weigh half a ton and they can be ferocious. today in the arctic circle one of the most beautiful places on the planet, it's warmer than usual. there isn't much food for the polar bears . so when a group of british youngster on a wildlife adventure trip set up camp for the night they became bait for a bear. they woke to a roar, a polar bear burst into a tent, slashing with razor claws, snapping with razor teeth. terrified, the boys fought back. two guides badly injured and 17-year-old chapel killed, a schoolboy who wanted to study medicine. >> by all accounts, he would have made an excellent doctor. >> reporter: patrick flynn is here with his father preparing for the trip of a lifetime was bitten in the head. >> the polar bear got into the tent where patrick was and they just for some reason grabbed horatio and just killed him. >> his parents devastated said in a bizarre twist, his namesake, the 18th century british naval hero, had fought a polar bear on the very same glacier and survived. moore would have been killed but for the bravery of 29-year-old mike reid . four times he fired his gun at the bear but it misfired each time. as the bear slashed him, severely cutting his neck and head, reed bloodstreaming reloaded, fooird and killed the bear. there are about 2,000 polar bears here, but it's believed that with global warming , food is scarce. a post-mortem showed this polar bear was 110 pounds underweight with almost no fat reserves. it must have been starving. >> if there is any food source there, they will come after you for that. it's just a natural process. whether you can put them off is the key question. >> reporter: tragically the british youngsters could not. >> the expedition cut short its trip and questions. why did the gun not fire, why did the warning trip wide stop bears not work and especially this time of year when polar bears were hungry why were the youngsters there in the first place? hard yeses questions as the family mourns their son. 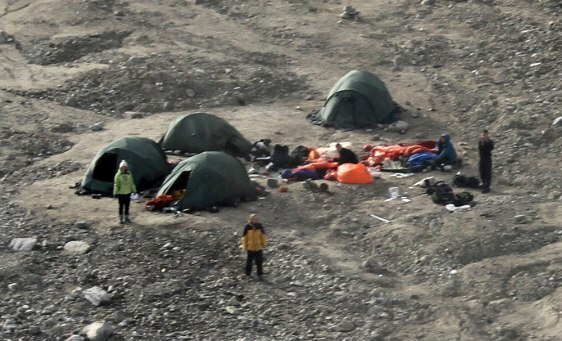 This campsite was attacked by a polar bear early Friday in Norway's Svalbard region.